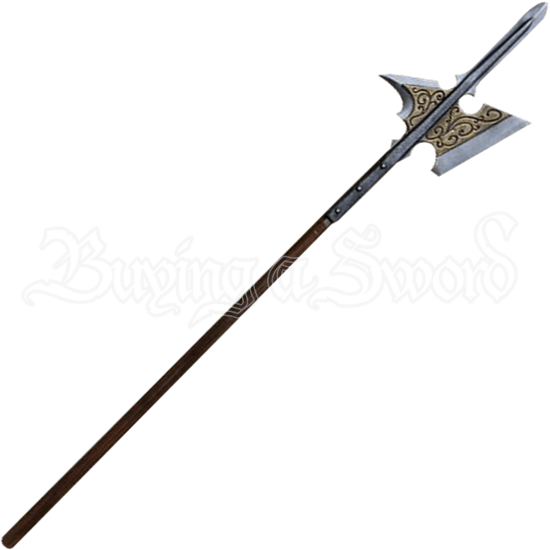 Defend the kingdom and strike down your foes with the Kingsguard LARP Halberd. Combining the best bits of an axe and a spear, this unique medieval weapon is made safe for LARP through its high quality, closed cell foam construction. Resistant to shredding and coated with latex, this LARP pole weapon has a flexible fiberglass core with a Kevlar tip. 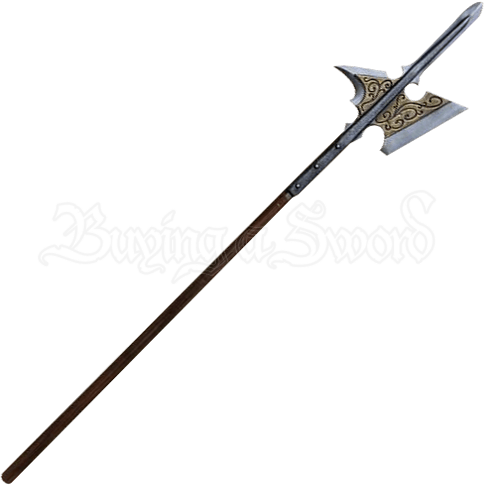 The spear portion has a double-sided look, beneath which is situated an ornate axe decorated with artistic, swirling vines over an antique brass background. A dark wood finish lends a realistic look to the foam handle. For reach, versatility, and style, wield this medieval LARP halberd during your next LARP battle. The Kingsguard LARP Halberd has an overall length of 74.8 inches. Please be aware that this measurement can vary slightly, as it is a hand-made item.